In an effort to better serve all of our customers, we’re implementing a new support ticketing system. Our new system utilizes ZenDesk, a leading online support system, to organize, track and manage support requests. Manna has been growing over the last six months and this change reflects our commitment to ensuring that our outstanding customer support continues to scale with our growth. The main difference is that all support requests by email should be sent to [email protected], NOT [email protected] The WebMaster account will be only be used for web development projects. So if you need assistance with Website Changes, Email Issues, Passwords, Use of WordPress as your CMS Solution, etc., email [email protected] and those requests will be automatically logged into the system. Replies to your requests will be delivered back to you by email and you can continue to utilize email to interact with our support team. 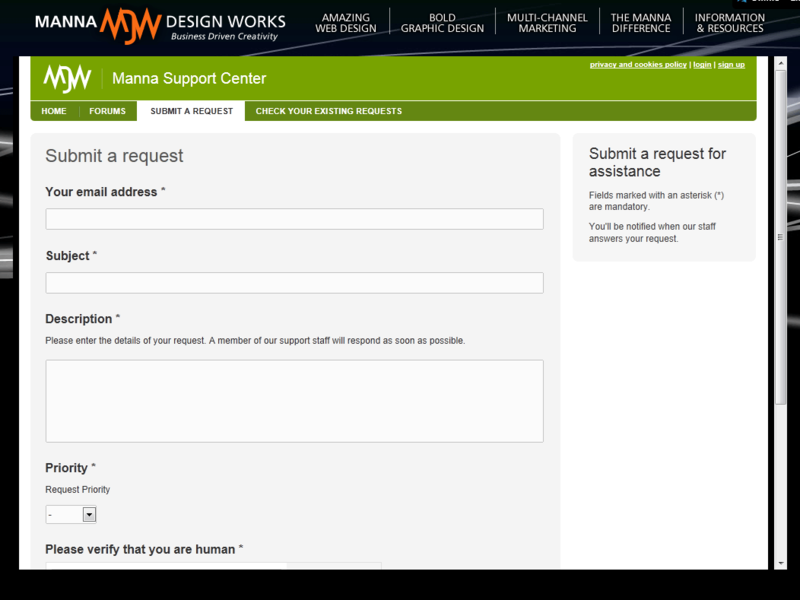 Additionally, you’ll also have the option of creating an account on our online system, www.MannaDesignWorks.com/Support where you will be able to log in to view and manage all of your support requests. This gives you an additional layer of interaction with the support system, should you choose to use it. You’ll find links to the online system in the support replies you receive by email. Again, using the online system is optional. If you wish, you can communicate with support by email just like before. If, when you call the support line no one is available to take the call, you will be prompted to leave a message as usual. The system will automatically create a support ticket for you and email you a confirmation. You will then be able to interact by email or the Support Center. If you need to speak with one of our team members, just let us know in the message and we’ll call you back as soon as we can. If you have any questions please feel free to call directly at: 856-881-7650 x 700 Thank you for your continued business, we look forward to providing you excellent customer service for years to come!